Walking through the Arab shuq you might notice graphic posters displayed in a number of shops. Perhaps one of the most striking says VISIT PALESTINE with a graphic of the Haram el-Sharif. Two of the most popular places to visit in Palestine are Bethlehem and Jericho. I am now authorized to guide there so you can now visit Palestine with me. Interesting thing is that the poster is not contemporary, not by a Palestinian artist or graphic designer and in fact, has nothing to do with “Palestine”, meaning the West Bank and Gaza. The poster is from 1936 when the whole area was Palestine under the British Mandate and the poster was designed by an Austrian Jewish artist living in Tel Aviv. Moving from Vienna to Berlin to Paris and then Barcelona, Franz Krausz and his wife Anni managed to flee Europe, came to Palestine in 1934 and settled in Tel Aviv. Krausz was a pioneer of art for advertising and designed posters for Israeli companies like Dubek cigarettes and Elite, the chocolate and candy manufacturer. Krausz most dynamic and colorful work was hand-painted gouache, sometimes based on photographic studies shot by his wife. My good friend and artist, Bob Gottlieb is living in Louisville, KY with my photograph of the “Petrified Trees” in the Large Makhtesh from my calendar and is planning to do a painting of the scene. Anyone else interested in trying their hand at painting from my photographs? For an example of a photograph and painting of the same scene, see my post on Banias stream. The “Visit Palestine” poster is Krausz’ best-known image, with just those two words in English, no Hebrew or Arabic, done using only six colors. 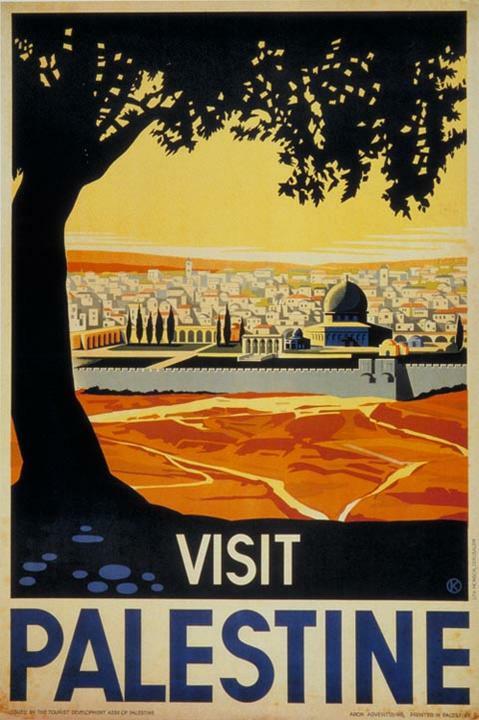 On the left foreground of the poster is a tree in silhouette, perhaps an olive, or oak or carob, framing a view of the Haram el-Sharif and Dome of the Rock, even the Dome of the Chain is shown, with Jerusalem behind – the view of the city is from the Mount of Olives. Although prolific and one of Israel’s most-accomplished graphic designers Krausz made very little money from his frugal clients. You might notice two other graphic posters in the Arab shuq. One, with English and Hebrew, has the words Tourism in Palestine as the caption at the top (in Hebrew, the text is Tourism in the Land of Israel). The main image is a gentleman, dressed in white, with a British explorer hat and high boots pointing at a map of Palestine, ostensibly a guide. The poster is an advertisement for “The Association of Jewish Guides, Properly Trained In All Subjects That Make a Good Guide, Is At Your Service Fixed Rates Apply to the Office” and to encourage the purchase of craft items made in the Holy Land in order to help it’s economy and the artists who lived here. The other poster has Come to Palestine on the bottom. 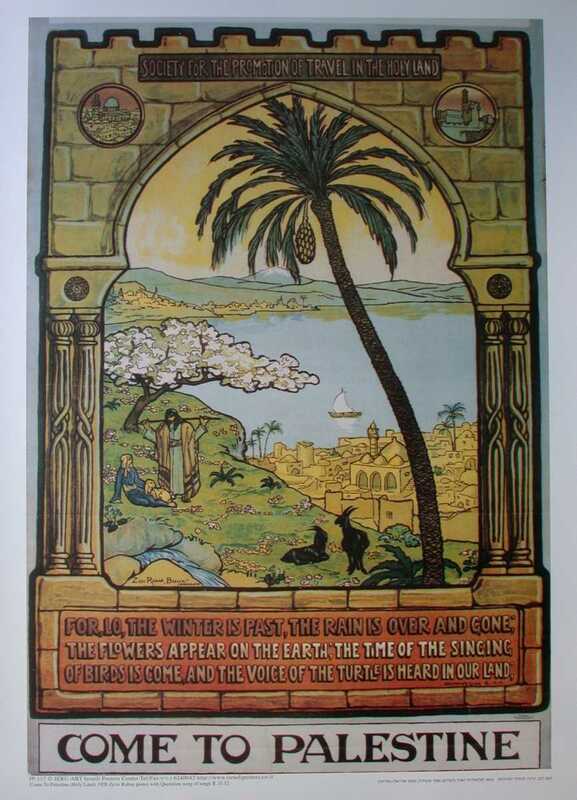 It has the words “Society for the Promotion of Travel in the Holy Land” across the top, with two circles, icons of the Dome of the Rock and Tower of David (like the previous poster). Below is an idyllic painting of a palm tree overlooking Tiberias and the Sea of Galilee with a snow-capped Mount Hermon in the distance, with shepherds sitting on the hillside beside an almond tree with blossoms. The scene is viewed through a horseshoe arch, the arch starts to curve inwards above the level of the capital or impost, a form developed during the early Islamic period. The whole thing, both Biblical and Zionist themes, is done in a style influenced by the European jugendstil (similar to Art Nouveau) and by traditional Persian and Syrian styles. 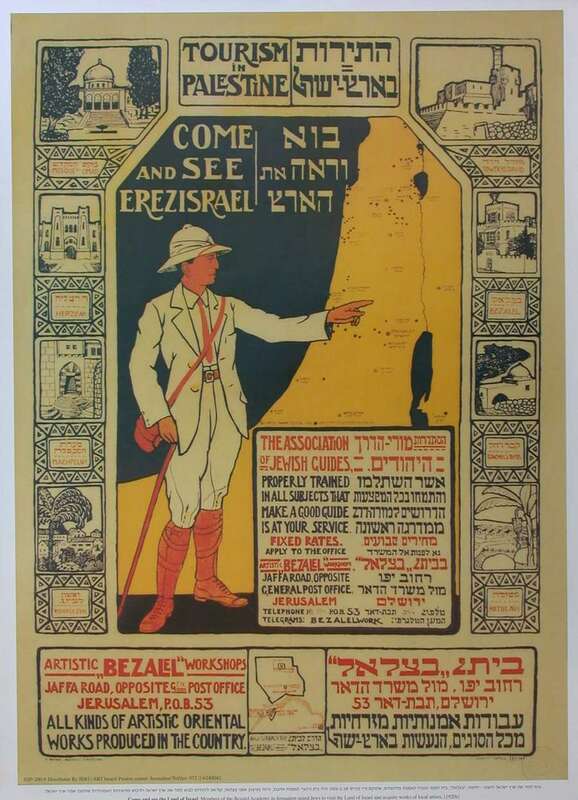 Both posters were designed by Zev Raban of the Bezalel Art Academy in Jerusalem in the mid 1920’s to promote tourism to Palestine. Under the influence of Boris Schatz, the founder of the Bezalel Academy, Raban moved to Palestine in 1912 during the wave of immigration known as the Second Aliyah. He joined the faculty of the Bezalel school, and soon took on a central role there as a teacher of repoussé, painting, and sculpture. He also directed the academy’s Graphics Press and the Industrial Art Studio. By 1914, most of the works produced in the school’s workshops were of his design. This entry was posted in Art and tagged Bezalel Art Academy, ceramic tiles, graphic art posters, Guide, Palestine, Tel Aviv on May 12, 2013 by Shmuel Browns.